The Tokyo-based Japan Studio, responsible for PlayStation 2 classics such as Ico, Shadow of the Colossus, and the Ape Escape franchise, seemed A.W.O.L. for much of the PS3 generation. Now, on the eve of the PlayStation 4's release, Japan Studio is trying to make a major comeback. I went to Tokyo to find out how. It wasn't a single trip. I had to go to Tokyo twice to get the full story, and to gain an audience with the man who is sort of Sony's secret weapon for making Japan Studio a force to be reckoned with once again. That man is Allan Becker, former head of Sony Santa Monica which is, not coincidentally, one of the studios that defined the PS2 and PS3 generation with the likes of God of War and thatgamecompany's Flow, Flower and Journey. Becker now runs Japan Studio and it was in the studio's Tokyo offices that he told me about his goal: "For Japan Studio to be relevant globally in two and a half years." Becker wants Japan Studio to be back in a big way. When I asked him whether we can expect strong PS4 titles from the studio, his reply was simple: "Absolutely." In an age when Sony studios in California and Amsterdam make standout games like Uncharted, Last of Us and Killzone, getting a studio whose most notable PS3 games between 2006 and the beginning of this year were Siren: Blood Curse, Echochrome and Tokyo Jungle to play a major role on PS4 would be a huge deal. And it'd be a boon to PS4 gamers everywhere. Getting there, however, won't be that easy. Becker, who has been at the studio for two and half years, inherited something of a mess. "The thing I was shocked by was the number of titles in production," he said of when he first arrived. "That completely blew my mind." At that time, there were 40-something titles in production, and the environment was, what Becker called, "a free-for-all." That was then. Now, Sony's most creative studio is starting to make leaps towards recapturing its former brilliance. My first trip to Tokyo happened in mid-September. I took the bullet train from Osaka, where I live and have so for over the past decade. The Allan Becker interview didn't look like it was going to happen, and I'd need a second trip for that. However, I was going to see some of the most powerful individuals on the PlayStation team, including one with deep Japan Studio roots and another who had more recently taken hold. The first of those two was Shuhei Yoshida, the Internet's new favorite gaming executive, a ubiquitous Twitter personality who travels the world in his job as the chief of all of Sony's game development studios. Among gamers, the always affable Yoshida has become well-known for his willingness to be frank and to interact with PlayStation gamers on Twitter—an openness that might raise eyebrows among Japan's traditional (and stodgy) business culture. I sat with Yoshida by an enormous hotel suite table covered with an array of PlayStation hardware. To help me tell the Japan Studio's story, he turned back the clock. Between 1996 and 2000, Yoshida was mainly managing the Japan Studio at Sony's Tokyo headquarters. "I started hiring people and created internal teams that eventually made Ape Escape, The Legend of Dragoon, and Ico," Yoshida said. He produced titles like the first Gran Turismo, whose team, led by Kazunori Yamauchi, were spun off into their own studio, Polyphony Digital. Yoshida produced PlayStation 1 role-playing game The Legend of Dragoon, overseeing a hundred-person team and a $16 million budget, which, at the time, was quite large. "Eventually, we recouped that, thanks to sales outside Japan," says Yoshida. "The sales in the U.S. were very strong." Even in the early days, success abroad was key to the Japan Studio. It wasn't only the internal titles that helped make PlayStation a winner. Starting with the first PlayStation, Sony was blessed with a seemingly endless reservoir of games. "There was no shortage of great third party games," says Yoshida. "That really pushed the PlayStation in Japan." While Sony also had first-party, internally-developed games, the Tokyo-based giant wasn't exactly Nintendo. You bought Sony hardware to play video games from an array of what often seemed like other Japanese studios, whether that was Resident Evil, Final Fantasy VII, or Metal Gear Solid. Strong internally developed Sony titles were gravy. Yoshida was proud of Sony's games but acknowledged that the embarrassment of third-party riches could have led to complacency. "And so, probably the company took getting some third party support for granted," said Yoshida. "[And thought that] PlayStation can be successful without a strong first party." There were critical and commercial successes for the Japan Studio, especially on the PS2 and on Sony's portable hardware. But entering into the PS3 era in 2006, console success seemed increasingly elusive. Other Sony first party studios were doing gangbusters and taking the lead. Sony Santa Monica, which Allan Becker founded, churned out the smash hit God of War franchise as well as smaller, artistic titles. Increasingly, the Japan Studio was being eclipsed by its sister studios. The way that the games were developed at Sony in Japan was different than in the West. According to Yoshida, "Games made in Japan were kind of driven by grassroots and bottom up, with people making what they wanted to make without much strategic direction or huge ambitions. Of course, there were some creators who had ambition, like Kazunori Yamauchi or Fumito Ueda. Those people with a clear vision." Yoshida wasn't saying that all other Sony developers in Japan were devoid of drive. Rather, it appeared that many of the developers were making what they wanted to make without thinking about whether or not anyone would want to play their game—and, just as important, without applying a structure to the development process. Things were fluid. Perhaps, they were a little too fluid. Yoshida took official responsibility of Japan Studio in 2008. But Yoshida's plate was full: That was the same year work began on the PS Vita and the PS4. Yoshida was stretched thin. Every week, he was in meetings with the hardware teams getting the Vita ready for release. And when he wasn't doing that, it seemed like he was fielding questions about The Last Guardian, a game that was surely going to be the next big game from Japan Studio, the follow-up to the artful PS2 greats Ico and Shadow of the Colossus. Then, suddenly, the Japanese game industry changed. All the old rules were thrown out and kicked down the street. There was a new kid ruling the roost: smartphone games. "When you look at what people are spending on free-to-play games on the mobile market in Japan compared to the Western market, it's almost ten times different," said Yoshida. "Japanese people like to spend lots of money on mobile games, so publishers started to shift resources away to those mobile games." More smartphone games started appearing, and it sometimes seemed like home and dedicated portable consoles were being forsaken. Smartphone games were cheap to make, and the possible returns were lucrative. Major third-party developers in Japan began to shift their focus. Many of the people who play mobile games in Japan or elsewhere have fickle tastes. I know it. You know it. And Shuhei Yoshida knows it. The casual market shoots up, he said, gesturing with his hand. And then it comes down, mimicking that with another gesture. "But still, it's a profitable market," Yoshida said, adding that it "came at the risk of the PlayStation platform not getting any support from third-party [developers]." That, he said, was "an alarm call." "We launched the PS Vita and saw few AAA titles to suit the Japanese market," Yoshida said. "Everyone got a wake up call." The solution was obvious and it was going to involve Sony's Japan Studio. "We really have to support our first party," Yoshida remembered thinking. That was 2011. And by the next year, Sony brought in Allan Becker to make sure that the studio could deliver. There was a second top PlayStation person with whom I spoke during that first Tokyo trip, but before getting to him, we must get to Becker. I had to return to Tokyo to see him, once again taking the train from Osaka. I'd heard interesting things about Becker—about how talented he was, about what a low profile he kept, and about how he seemed like the perfect person for the job. "It must be a very interesting life story of a person," Yoshida had said to me about Becker. "Born to an American father and a Japanese mother. Growing up in Japan until he was 18. "And," Yoshida continued, "he came back and started to turn things around at the Japan Studio." Before arriving at the Japan Studio to talk with Allan Becker, I did what anyone would: I Googled him. I couldn't find a picture of him and didn't see any interviews. Had he ever done any? I wondered. Here's the guy who founded one of Sony's most successful studios and helped spearhead one of its most successful franchises, but until now, he was someone I'd only heard people talk about—make that, say nothing but good things about. Some people who develop games put themselves out there. Not Becker. A few years back, Allan left Sony Santa Monica to take over Sony's Japan Studio after a very, very successful run as the SM studio head. When he was at Santa Monica he spearheaded a lot of amazing games, including bringing Gran Turismo PS2 to America (along with sir Taku, of course), TM:BLACK, WAR OF THE MONSTERS, FLOW, FLOWER, JOURNEY, KINETICA, and the GOD OF WAR franchise. He also was the guy who funded and supported LA NOIR for a long time before that game left Sony and went to RockStar, along with SIX DAYS IN FALLUJAH and [a] bunch of other very imaginative, cool games that never came out but clearly carried the banner for 'games as art/games-being-more-conceptually-meaningful-than-games-as-action-movies'. ** He also made lots of earlier Sony hits as well (from Equinox to Skyblazer to Twisted Metal to Jet Moto). Point is: I'm real proud of the guy cause the first two games out his revamped Sony Japan Studio just hit the press and it's very exciting to see that the Allan Becker touch is still very much alive and well... Since the press NEVER covers him (which is prob. how he likes it) I figured I'd give the man a well deserved, long overdue shout out. It was the week after the Tokyo Game Show, it was raining, I didn't have an umbrella, and I was back in Tokyo. Becker was going to speak to me, but before that, I was going to see one of Japan Studio's newest games. Puppeteer had just come out. Rain was on the verge of release. Becker's vision for the Japan Studio was no longer theoretical. People could play it. I walked in from the rain that day and, fittingly, into a demonstration of the game Rain. While the demo went on, Becker entered the conference room. People's postures improved, and at least I could sense people getting on their toes. Becker was approachable and low-key. Yoshida had described him as "cool," able to objectively see what works and what doesn't. He offered a "don't mind me" in Japanese to everyone around the table. But make no mistake; the boss had entered the room. After seeing Rain, I asked Becker why he came to run Japan Studio, and he joked that it was "because Shuhei asked." But talking to Becker, it became more apparent why he's traded Santa Monica for Tokyo: He's returned home. "I was born in Japan," said the soft-spoken Becker. "I grew up here in Tokyo until I was 18." As Yoshida mentioned earlier, Becker was born to a Japanese mother and an American father. He grew up speaking both Japanese and English, being exposed to both cultures and attending an American school in Japan. I was instantly reminded of my own two sons, both of mixed heritage. But unlike Becker, neither of my kids are fluent in English, which is something that I have been working on increasingly hard of late to change. But whenever I meet someone born in Japan with a multicultural background, I feel a connection—that I have a vague idea of what things are like for them, the questions about their parents, about whether they can speak a second language fluently, and how perplexed people can be when your name isn't something standard like "Tanaka" or "Yamada." But it isn't just an issue in Japan. Last year, the sight of the name "Allan Becker" led members of the webforum NeoGAF to worry that a foreigner was taking over the studio. Growing up in Japan, Becker thought he was a "full-blown American." That is, until he went to university in the U.S. "And I discovered that I wasn't, that I was very Japanese," said Becker. "It was a tremendous culture shock for me." I asked him if there was anything in particular, but Becker said that nothing specific comes to mind. "Everything was completely different," he says. "The two cultures are almost diametrically opposed. "In the United States, you have—it's kind of clichéd—a very individualistic society, whereas in Japan, there is a sense of group thinking, conformity, and rules," said Becker. "So, it was a complete shock for me." According to Becker, being in the U.S. for decades slowly converted him to being an American. "Right now, I feel pretty well-balanced," he said. "It's essentially my home," Becker said of Japan. "And I think that's the reason I wanted to return. There was something inside of me that kept, I dunno, directing me to come back." When Becker came back, there were over 40 titles in development at the Japan Studio. Becker had to make the tough calls. "In some sense, it was great that everyone got to do what they wanted to, and there was this sense of a creative playground," said Becker. "And nothing was getting done. And nothing was selling." Becker stopped. He said he didn't want to get "too negative." He was not sugarcoating, and this wasn't typical video game PR speak. He explained the situation that he walked into. His honesty was refreshing. It wasn't just the rise of smartphone games that complicated the video game industry in Japan. It was also the rise of Western studios. "I think, and it's also kind of clichéd, but I think in terms of process, methodology, and technology, we fell far behind the West," Becker said. "The West sort of took off in some sense. They were able to make larger games." The Western studios were better organized to handle large projects. "And in Japan, I don't think that process really caught on in terms of how to manage a larger team," he said. "There was a little bit of a 'trying to make a large game with a small game attitude.'" Becker described the sheer love and passion the studio's developers had for the titles—all 40-odd of them—they were creating. Creativity was never the problem at the Japan Studio. Neither was the passion to make games. "And so," he said, "I was really troubled when I had to really start to focus and cut titles." "That must have been stressful for you," I replied. "Yeah, it was," said Becker. "To see so many people disappointed." But the studio started to move forward, seeing small successes. And that's when, according to Becker, the attitude began to shift, and the studio began to zero in on what it does best. "I think to before the creativity was all spread out," he says. "It's become more focused." As I noted earlier, my timing for my look into Japan Studio was pretty good. Technically, I must point out that it wasn't something Sony was asking for. Heck, when I went into my Yoshida interview, I told him right off the bat that I wasn't going to ask about the latest Sony hardware that had been spread out on the table. Sony has been pushing the PS3 and the Vita and the PS4. It's been highlighting various games. No one in the company said, "Hey look, Japan Studio is making a comeback." They didn't have to. If you look for yourself, you see it. You see it in Puppeteer. You see it in Rain. You also see it in the PS4 launch line-up which includes, front and center, a game called Knack. Knack is one of two major full-size, first-party launch games for the PS4. It's from Japan Studio, but it has its own atypical figure behind it: Mark Cerny, no less than the chief system architect of the PS4 and a game developer who has kept one foot on each side of the Pacific for most of his career. On the same trip I spoke to Yoshida, Cerny was in a conference room on the ninth floor of Sony Computer Entertainment's Shinagawa building—the same conference room where I'd talk to Becker a week later. Cerny had spent the morning showing off his latest title, Knack, to a room full of game journalists in town for the Tokyo Game Show. When Cerny wasn't demoing the game, he was translating for his other Japanese team members. He kept apologizing for his Japanese, saying his translations might be off. But his translations were dead on. It seemed to me that Cerny had acquired more than Japanese language skills while in the country: He also picked up Japanese humility. Not yet 50, Cerny has been making successful video games for more than three decades. While still in his teens, Cerny was a computer programming wunderkind, joining Atari when he was only 17. By 18, he had created hit arcade game Marble Madness. By the time he was in his 20s, Cerny was living in Japan, making games at Sega, and becoming fluent in Japanese. For Cerny and other developers of his generation, Japan was the place to be. In the mid-1990s, he returned to the U.S. armed with the skills he picked up in Japan and prepared to work on titles like Crash Bandicoot and Ratchet and Clank, among many others. Now, he's best known as the chief architect behind the PS Vita and the PS4—not to mention the guy who designed Knack. When production was starting on Knack, Japan Studio didn't have the structure of Sony's other marquee studios, most notably Sony Santa Monica. At that time, there were "production issues," Cerny recalled. "Very frankly," Cerny added, "they were having problems getting console titles out." "The Japan Studio has all this creativity," Cerny remembered thinking. "And so, if we can somehow enter into a structured project, that can have success of a level that hasn't happened in almost a decade in the home console market for this studio." Starting with Knack, the way games were made at Japan Studio really began to change. The goal was to bring the coherence and the studio of Sony Santa Monica to Tokyo. He called that southern California development outfit, Becker's old studio, "an amazing place." "Sony Santa Monica is one of the best-run studios in the world," said Cerny, adding that they've tried to transport that methodology to Japan. Cerny paused, saying that this talk of structure probably "isn't the most exciting thing." It certainly was not hype or a teaser trailer or building up wild expectations. This was nuts and bolts stuff. And hearing Cerny talk was fascinating. "Structure is how you make sure, when you make a level, that it's 30 minutes long and that you have 30 minutes of gameplay," said Cerny. "Whereas if you don't have structure, you end up making a level that is two hours long, that took you six months to create, and that still only has the few gameplay elements you originally thought of. "This is how we make games," said Cerny. "We know we need a certain number of good ideas to create a game, but we know if we have too many of them, then they can start to hurt us. And things can spin out of control." "You've got to have the creativity on one side and the discipline on the other side," Cerny said. "Ultimately, the structure allows them to happen simultaneously." There's something incredibly Japanese about the approach. Ironic, yes, because Cerny is not Japanese and Sony Santa Monica is a California studio. But the sense of structure is seen throughout Japanese society—from pre-school to corporate life, things are incredibly structured. In Japanese, the notion of doing "whatever you like" is seen as showing a lack of discipline, especially among older Japanese who grew up in the Post-War Era and were forced to sacrifice and endure. Structure can make enduring easier. It focuses you. "In games, everything has a tendency to get larger and more complex," said Cerny. "Structure helps you fight it." Look at the recent games from Japan Studio and there are signs of just what Cerny was talking about:. Games like Puppeteer, Rain, and Knack are crisp and well-programmed. Compared to balloon budgeted titles from other studios, these games are smaller and more manageable. At the same time, some of them are even incredibly personal. All of them display a strong craftsmanship—a word that Rain director Yuki Ikeda brought up when he was showing me his game. The word came up a lot. "I want people to know Rain was made by Japanese artisans," Ikeda told me in Tokyo. The actual word he used was the plural "shokunintachi" (職人たち). The word "shokunin" (職人) is defined as "artisan" or "craftsman" or "someone who's mastered a profession," but the word can have a much deeper meaning. It's all about giving it your all, improving your craft, and striving for perfection. "Shokunin" was a traditional class of craftsman, schooled in traditional arts like sword-making. Today, shokunin can be master sushi chefs, carpenters, eye glasses craftsmen, Japanese confectionary makers, or even game developers at Japan Studio, making Rain. The professions are different, but at their pinnacle, what unites the modern day shokunin workers is their desire for perfection. There was another apt Japanese word that came up as I talked to people about the Japan Studio. It came from Becker. The Studio chief had mentioned Japan's rigorous craftsmanship tradition as well as the Japanese notion of service as two things he thought would resonate with players around the world. "In Japan, there's this idea of 'omotenashi,' which is 'thoughtful service,'" Becker said. "You know, really considering the receiver." This is a notion that exists in Japanese society. Becker believes it naturally finds its way into the Japan Studio's games, providing experiences that players could not get from other Sony studios. Others might feel like this is one of the most creatively free studios in the world. During my second visit, in the Japan Studio hallway, I saw game designer Gavin Moore, pulled him aside, and we talked. Moore's been in Japan for the past decade, and I asked him about the studio. Becker had expressed comfort in his studio but also an awareness that some of his developers might feel newly stifled. "I'm pretty happy [with] where things are, but everything has the other side," Becker had said. "Some people might feel there's a loss of creative freedom that existed before." Moore didn't seem to indicate anything of the sort, talking about how the Japan Studio offers more freedom than you'd get at a big name game developer in the West. "Our marching orders are to make games you would never see on any other console," said Moore. Case in point, Moore's own game, Puppeteer. "If I showed this crazy puppet character to any other Western studio, they would've said I was crazy," Moore said. Instead, his colleagues at Studio Japan thought it would make an interesting game. "There's more of a willingness to be open here," said Moore. "That's why this studio is appealing to me. We are willing to take risks." Puppeteer wasn't only risky—how many games can say they were inspired by Japanese bunraku theater?—but personal. The story and the characters came from an unfinished picture book Moore had been writing for his son. Moore recalled a time when his 9 year-old son put down the DualShock 3 and went outside and played. "As a dad, that was awesome," he said. "But not as the Creative Director of the Japan Studio." Moore's son told him that he was always playing the same thing. "I want a game that changes all the time," he told his father. That got the gears turning and resulted in Puppeteer. "He loves the game," said Moore, beaming. "He thinks it's his game, and he's asking me where his royalties are." These are the types of games Becker loves. These are the kind of games he wants the Japan Studio to make. "These games are close to my heart," said Becker. "I love these art house type games. So, I think these kinds of titles, we'd love to continue to make, and they are indeed representative of J-Studio." Becker went on to add that the goal is to provide more than simply action, but rather, something special. "It's a deeper experience." 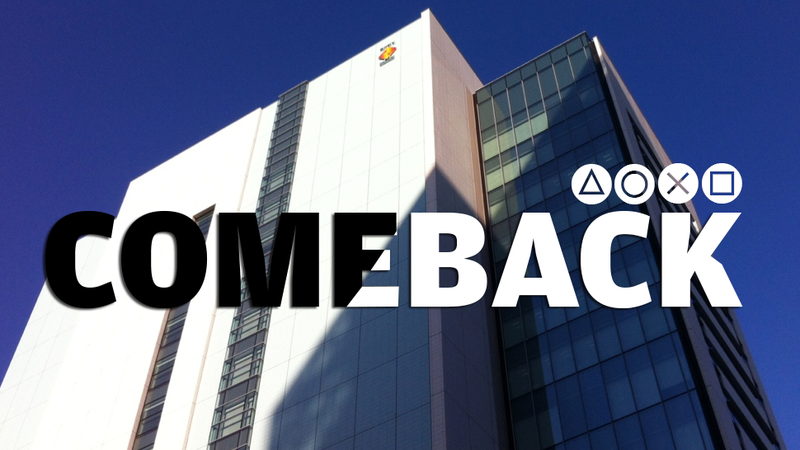 As my time at Sony's Tokyo offices was winding down, I had to address the elephant in the room. Or rather, make that a large griffin-like animal. Fumito Ueda, the famed Japan Studio game creator behind Ico, Shadow of the Colossus, and The Last Guardian was mentioned repeatedly throughout the interviews. But the status of that third game, nearly five years in the making and waiting, remains unclear. And while work continues, Ueda doesn't even technically work for Japan Studio anymore, even if he is still there. The takeaway I got was that Ueda hasn't gone away. He's still there at Japan Studio, toiling away. The Last Guardian was first announced in 2009, and it hasn't yet been released. I ask whether or not Becker thinks that the more structured environment at Japan Studio will help Fumito Ueda and The Last Guardian. "We're real-time in that process," Becker replied. "And we don't necessarily agree with each other—Fumito Ueda and I—about process. In some sense, I sort of... implemented change, which, I think, is causing some concern and consternation. But, once again, I think the benefit will come through. We're still going through that phase of adjustment and finding the right balance and groove." "I think," Becker adds, "it's moving along in the right direction." It seems that all of Japan Studio is, after more than a half decade of not making an impact, heading in the right direction. If you bought a PS3 to play Japan Studio games, you were left wanting. Not so, it seems with the PS4. Not so, it seems with the new Japan Studio. Putting those "production issues" behind itself, the studio is pushing itself to be better—to focus its creative energy, distill its ideas, and most importantly, get games out into players' hands. Yet, there's a greater desire here. A desire to better one's craft. A desire to offer polished, refined work. A desire to show the world not only what the Japan Studio can do, but what made-in-Japan games can be. And hopefully, what they will be.